It's been a while since I reviewed anything from Alter Eco, and since World Market had all of Alter Eco's chocolate on sale a couple of weeks ago, I snagged this blue bar of 85% cocoa content chocolate, the Blackout bar. It's labeled to be "bittersweet cocoa" with "deep fruity intensity." I do tend to love chocolate in the 80% range, maybe especially after all of the mid-range chocolate I've been looking at lately. Alter Eco is, of course, organic and fair trade. They have some info on the back about the cocoa, which is grown in Ecuador and then shipped to Switzerland for roasting and conching. 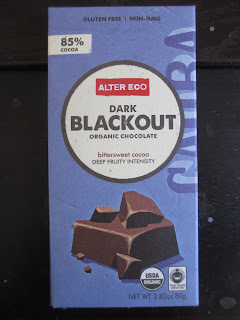 That last bit is interesting; if I knew that Alter Eco (which is based out of San Francisco) made their chocolate (or at least this chocolate) in Switzerland, I had long since forgotten the fact. Start folding open the card box and you'll find some more info, specific to the co-ops that grow Alter Eco's cocoa and the trees that they plant in order to reinvigorate and support the rain forest. All very good; now let's move on. This chocolate has a nice and dark smell, almost with those marshmallow notes to it. The taste is slightly red and almost bitter on first touch, then it develops a little more of a tang that melts outward into more bitterness that is soon replaced by a gentle deepness. Here the chocolate becomes cool and soft in taste and texture. It's fairly mild without lots of flavor notes of this or that; I would say they're kind of earthy notes, maybe like leather, just nice and simple. Mainly I find a deep chocolate taste with that accent of bitterness. It finishes with a taste of cocoa nibs, that deep blue flavor that you know is a little bitter but almost feels like it's sweet. Sure, I probably wouldn't recommend this bar to milk chocolate lovers. It veers a little too close to the bitter edges of the dark side for that. Not all chocolate at 85% has the notes of bitterness that this chocolate has. But with that said, this also isn't a dries-your-mouth-out-with-stinging-bitterness type of bar. Not like a bitter Bonnat bar, for instance. If I recall correctly, these notes of bitterness still don't have the elegance of Patric Chocolate (it's been some years since I had their chocolate). This is more of a standard, deep, dark chocolate. 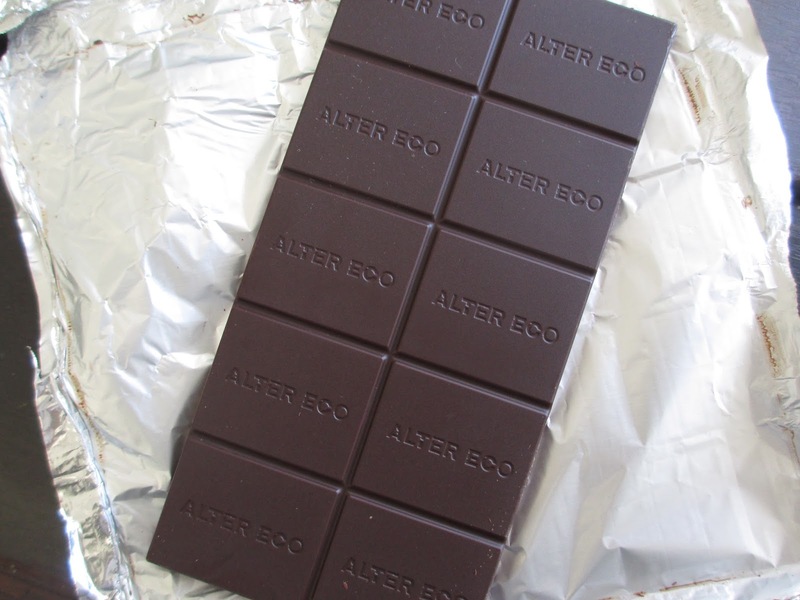 Alter Eco is one of the brands that you see at many stores (World Market and Whole Foods among them). So this is a bar that you can count on: you can count on finding it and you can count on it delivering a certain type of taste. I'm not sure it's my favorite. There are other brands that I prefer, and maybe that bitter twinge here is just a little too much for me. But I don't find that a complaint. This is a good bar of chocolate if you're looking for something truly dark. And it would also work well in recipes (I feel like I've been buying so many flavored chocolate bars lately that whenever I have a bar of plain chocolate I get excited at the idea that I can use it in case I have need to make flourless chocolate cake or brownies sometime in the near future). I perhaps haven't developed as much affection for the flavors of Alter Eco (though they do make wonderful truffles) as I have for another standard brand like Theo, but I equally support Alter Eco's approach and even if sometimes their flavors aren't as much my style, whatever products I've tried so far have been good and that isn't always the case with the "ethical" chocolate brands. Some of them I just avoid because I don't think they taste very good or are very good quality and therefore I don't see the point. So even if this sounded like a lukewarm review because I said this bar wasn't my favorite, I'm still counting my comments as positive.